An old newspaper clipping reveals the origin of SkullFace, detailing how, as a teenager, he attempted to steal computers from Bio-Tech, a government research facility. He was chased by a number of security guards and police officers which included a younger Frank Darling. The teenager ended up slipping into a vat of chemicals that transformed everything except his eyes, hair and bones completely transparent. In the present day, SkullFace now prepares to finish off his confrontation with Frank Darling but has a metal pole rammed into his eye. This enrages the villain who chases his prey to a rooftop where he leaps at the exhausted Frank so that he could deliver the killing blow. Frank ducks this attack and SkullFace spills over onto a gas tank on the ground below. After the super-freak spills open the flammable contents, Frank throws a lighter into it and ignites the material, causing a massive explosion. Mace commences a brutal beating upon the possessed Dragon which causes those police officers still conscious to plead with him to stop before he kills their friend. The vicious vigilante has no intention of stopping but his ball and chain end up killing the leech that had been controlling Dragon’s actions. As he regains his mental faculties, Mace attempts to land a final blow but his weapon is caught by Dragon who then delivers a powerful punch that breaks his opponent’s jaw and knocks him out. She-Dragon is discovered to have survived the ordeal while Star manages to crawl into a waiting car where he reports his injuries to a hidden employer, stating that he has made a big mistake. Phil Dirt unmasks Mace and discovers that he has horrendous facial scarring on the top half of his head. Mace had actually been the teenaged sidekick to Super-Tough and fought alongside the veteran hero in the guise of Young-Tough. Their final mission together was against their nemesis, Damien DarkLord, who detonated a weapon called the Nega-Bomb. This device apparently killed DarkLord and Super-Tough and left Young-Tough with disfigurements which cost him a place on the Youngblood roster. It is also mentioned that one of the other victims of the Nega-Bomb was Pete Davidson whose radiation-soaked body transformed into the form of CessPool. The building that had been knocked down on top of Alex Wilde is pulled clear by Dragon but as she is rushed away for medical treatment, her new boyfriend arrives on the scene. He demands that Dragon get away from her and blames him fully for her state. 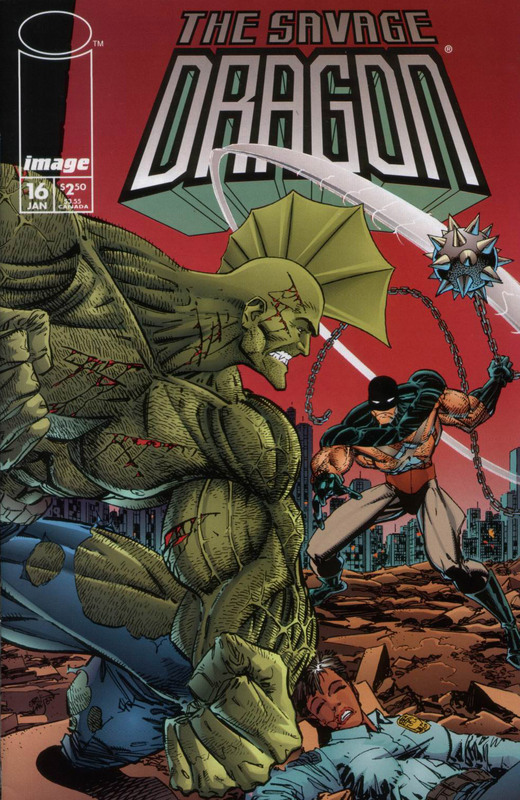 As the Underground Freaks recover from their battle, Darren McCarthy confronts Dragon over his actions. Dragon dismisses his colleague’s rant and heads off to do what he can to help repair the damage he had unwittingly caused. SkullFace had been consumed in the explosion from the ignited fuel and is now fused in position in the wreckage. A number of police officers arrive to investigate as the hiding Frank Darling makes an observation that although SkullFace outclassed him in power, he had greater local knowledge. In the end it was Frank’s familiarity with the territory that gained him the victory. Dragon’s rampage left thirteen people dead and forty-six injured which gives R. Richard Richards perfect ammunition to use in his vendetta against the hero. He appears on the television to state that he believes that Dragon should be hunted down and held accountable for his actions before he is cleared of any wrong doing like the Shrew had been. This broadcast bores the watching William Jonson who changes the television channel to witness the reunion of Emily Schwartzblatt with her estranged son Rodney. She is happy to see him again but also enraged that he allowed her to embarrass herself like she did on countless talk shows, declaring that Rodney had somehow transformed into Dragon. William informs Dragon that SkullFace has been found burned to a crisp in New Orleans and that aliens recently attempted an invasion in New York City. Mace starts to struggle with the officers guarding him but Dragon orders him to behave himself which he immediately does. Dragon then heads home to join up with Rapture. She talks how about how Freak Force saved the world from an alien threat and drags Dragon into bed with her so that he can thank her for saving the planet.